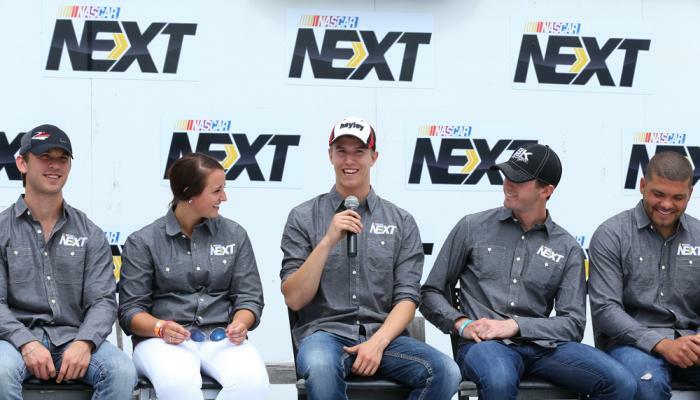 There are 13 drivers in the 2013 “NASCAR Next” class announced last week at Iowa Speedway, and 10 of them have something in common: a tie to the NASCAR K&N Pro Series. It gives each of them the closest look at the future of NASCAR racing – right there alongside them on the track each and every week. How they choose to look at that opportunity, however, often depends on their own unique perspective. NASCAR K&N Pro Series West driver Cameron Hayley, the only Canadian on the NASCAR Next roster, sees each week as an opportunity to stack up against the rest of the competition. Ben Kennedy picked up his first two career K&N Pro Series East wins this season, at Five Flags Speedway in Pensacola, Fla., and at historic Bowman Gray Stadium two weeks ago. He said that worrying so much about the competition – particularly in a development division where virtually every member of the garage is trying to get to the next level – can wreak havoc on week-to-week performance. The Daytona Beach, Fla., native said it becomes increasingly important to focus on the here and now in order to protect your future. “We've been trying to measure ourselves and compare, maybe a little too much recently,” Kennedy said. “It's tough with some of these races where you practice, qualify and all that jazz during the day, but then turn around and race at night. The K&N Pro Series drivers in the NASCAR Next program include Hayley, Kennedy, Gray Gaulding, Ryan Gifford, Dylan Kwasniewski, Brett Moffitt, Ben Rhodes, Kenzie Ruston, Michael Self and Daniel Suarez. They're joined in the industry initiative by NASCAR Camping World Truck Series drivers Jeb Burton and Chase Elliott, as well as NASCAR Whelen Modified Tour driver Ryan Preece. “As I'm getting older and learning more, you see that racing in the East Series – in such a competitive series – has been the best thing for me,” said Gifford, in his fourth year at Rev Racing. “It's been a blessing to be in the series for a little while. Gifford admits that it wasn't always easy to take a similar mindset. Like most young drivers coming into the series, he felt the pressure to perform almost immediately. That pressure, he said, can compound itself and produce negative results. Patience comes in two forms. It comes almost immediately in the race track, where pacing yourself and managing a race car for 150 laps pays big dividends at race's end. It also happens, in Gifford's case, when you start looking at the big picture. Waiting for the opportunity to come and pursue a national series ride becomes less stressful. In the end, the K&N Pro Series remains a tremendous proving ground for what's next in NASCAR. Gifford said a recent conversation with Richard Childress Racing Nationwide Series crew chief Danny Stockman helped cement that notion for him. NASCAR’s Cameron Hayley Says “I’m Going East! Cameron Hayley of Calgary, AB Canada will be heading over to Richmond Virginia for The NASCAR K&N East Pro Series race on Thursday, April 25th. At just 16 years old Hayley normally competes full time in the NASCAR K&N Pro West Series but he says that’s just not enough! When Hayley entered his first NASCAR K&N Pro race at 15 years old he finished an astounding second. After his recent Daytona UNOH Battle At The Beach win, he finished 2nd again in March at Phoenix! Can he keep up the winning pace? Time will tell. The Team hopes to keep their momentum going! They haven’t raced since early March due to a break in the schedule. After winning Daytona and finishing Phoenix with a very strong second place they are hungry for more top finishes. Hayley is racing for the Championship this year and he wants every advantage he can find. His goal is to move up NASCAR’s ladder into one of the national series in the next few years. He says getting more experience now will pay off later. CALGARY, Alberta – Cameron Hayley of Calgary, Alberta will be competing in two races this summer in the NASCAR Canadian Tire Series presented by Mobil 1, the top level of stock car racing in Canada. The 16-year-old, who won the inaugural UNOH Battle at the Beach at Daytona International Speedway in February, is in his second full season in the NASCAR K&N Pro Series West. Hayley will take advantage of open dates in the schedule for that series to race in the NASCAR Canadian Tire Series event at Motoplex Speedway and Event Park in Vernon, British Columbia on July 13 and at Auto Clearing Motor Speedway in Saskatoon, Saskatchewan on July 17. “I can’t wait to get back and race in my home country with the top drivers,” said Hayley. “It’s always a very exciting and competitive series. The race cars will be supplied by the two-time NASCAR Canadian Tire Series champion, D.J. Kennington – who runs his successful program out of Ontario. Hayley initially gained a lot of attention after finishing second in his series debut in 2011. Last season, he was named to NASCAR’s Next9 program, which features nine drivers in the NASCAR K&N Pro Series who represent the next wave of young talent set to make an impact on the national series scene. NASCAR Driver Cameron Hayley Finishes a Strong Second at Phoenix International Raceway! Phoenix AZ, March 2, 2013. Sixteen-year-old Cameron Hayley of Calgary Ab, Canada finished an exciting second place in the NASCAR K&N Pro Series West race at Phoenix tonight! Coming off his prestigious and exciting win at Daytona on Feb 19th Hayley was strong in Phoenix in both practices and qualified in a fast second behind teammate Greg Pursley who set a new track record. During the race Hayley took a late race lead from Pursley and appeared to have it locked in as the laps closed towards the checkered flag. However a wreck brought out the flags. On the restart an exciting chase by Pursley saw Hayley fall back to second place from the outside line. Hayley who just got his Driver’s License four months ago is already in his second full time season in the NASCAR Series. He is turning heads with his strong performance and smooth driving skills! Just last year; Hayley in his Rookie Year was nominated by “NASCAR” as one of the “Next Nine!” A driver showcased by NASCAR as one to watch in his climb as one of the next stars in NASCAR’s top levels of the sport. Hayley proved it again tonight! This race at Phoenix showed that Hayley has the talent and can be a strong contender on both the short and long tracks in the series.